I finally got my Hello Kitty Tutorial out. 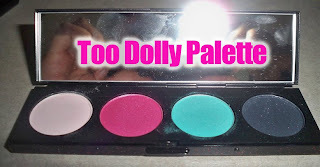 I know a lot of people have been using the Too Dolly Palette to do purple, pink, blue kind of looks. I wanted to do something different though. I only purchased the 3 items below and wanted to make a look using them. This was my favorite of the two palettes. The colors are pretty dupeable but I wanted at least one of the palettes for collection purposes. I've never owned a MAC glitter liner before. I'm impressed! They come out really pigmented and not sheer like some other liners. I went back and got another one, Her Glitz. You can definitely rock these are liquid shadow. Talk about glittery and super pretty! I really love this blush. It's a beauty powder blush so it's super smooth. I didn't think this color would show up on me but it gives me such a nice glow. I've only been rocking this blush lately. 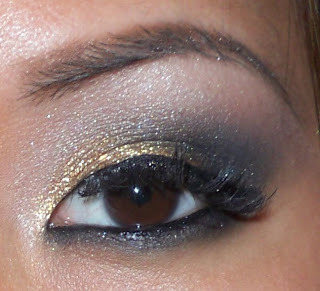 As you can see, I strayed from the typical Hello Kitty colors and went for a glittery gold/smokey evening look. It's really easy to do. I've been picking more simple tutorials lately because sometimes I can't deal with using 8 shadows in one look. It looks great...I learned a lot. I LOVEEEEEE this loook!! great tutorial!!! espcially for explaining how to use the glitter liner!! def want to try it out. and the palette! its my fave of the two as well! so pretty. Your brows are to DIE for!! I love this entire look! RenRen I love how you switched it up and came up with this gorgeous eye! That gold just makes your eyes sparkle & I love it! Hi RenRen - gorgeous look! 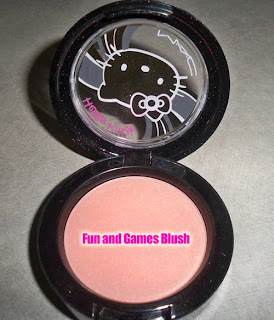 Oh, and you convinced me to get that Hello Kitty blush. Agh, I keep going back to buy more of that collection! Very nice look. I bought that blush too, but haven't tried it yet. I didn't think twice about the glitter liners - until now. I love love love this look. I like how that liner can be used on the lid like that. Hi there-looking gorgeous my dear!! gorgeous look sis! Gold is your color! I was a little skeptical about the "glitter eyeliner" but I loved how you pulled it off... Very cute & chic! hey ren.. is that fun & games on ur cheeks? is there a clearer pic? i wanna get that instead.. i find that tippy is soo pink for me =T can i plz see swatches on ur cheeks.. thanks! as always.. ur lookin absolutely GORGEOUS!